Chole Bhature is also know as chola poori. It is a very popular Punjabi dish which is usually served as breakfast. Chole bhature is a combination of chole and fried Indian bread. Chole is prepared with chick peas and bhatoora is a fried Indian bread made of all purpose flour/maida. Chole and bhature are make for each other, so I am giving the recipe for both together in a single post. I have not got so many requests for a single recipe as I got for this. At last I have decided to post this. Today we will learn how to make Punjabi Chole Bhature following this easy recipe with simple step wise pictures. In a bowl mix together maida, rava, salt, sugar and baking powder. Add warm water and make a slightly stiff dough just as you make for poori. Grease your hands with oil and knead the dough well. Cover it and keep it aside for 2 hours. After 2 hours- Your bhatura dough is ready. Knead the dough again and make small lemon sized balls out of it. Heat oil in a kadai, (to check if the oil is hot enough, drop a small piece of dough into the oil, if it raises to the surface immediately, then the oil is ready for frying. Keep the heat in medium and gently slide the rolled out dough into the hot oil. After a few seconds, press it with a slotted ladle so that it will puff up nicely. Make sure that you have enough oil, otherwise the bhatura will not puff up. Fry both sides until golden brown. Then remove it from the oil with a slotted ladle and serve hot with chole. Repeat the same process for the rest of the dough. Wash and soak chick peas overnight. Pressure cook for 5-6 whistles or until soft with just enough water to cover the chickpeas. Soak cashew nuts in hot water and grind it to a paste. Keep it aside. First keep all the things ready. It saves you a lot of time and also you will not forget anything. Heat oil in a kadai, add all the ingredients mentioned under seasoning. Then add the minced ginger and garlic and saute for a few seconds. Then add finely chopped onions, minced green chillies and saute until the onions become golden brown. You need lot of patience for this. Add a little salt to speed up the process. Once the onion becomes golden brown, add ginger garlic paste and saute until the raw flavor goes. Cook until the tomatoes become mushy and oil separates. Compare the picture above and below to see how the tomatoes are cooked. Add turmeric powder, chilli powder, cashew nut paste, salt needed and cook for a few more minutes until the raw smell goes. Now add cooked chickpeas along with the water. If required add more water according to the consistency required. Add tomato ketchup, channa masala and cook simmered for 15 minutes. Add chaat masala and cook for another few minutes. Garnish with fried onions (optional), coriander leaves and fresh cream. 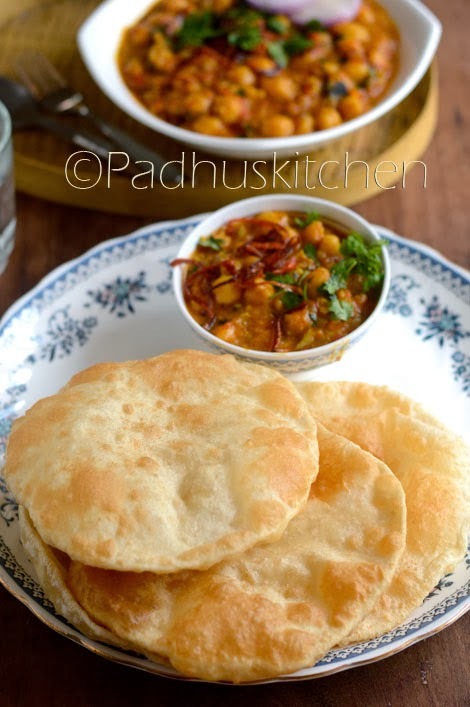 Serve Chole with hot bhatura. Prepare chole first and then bhatura. 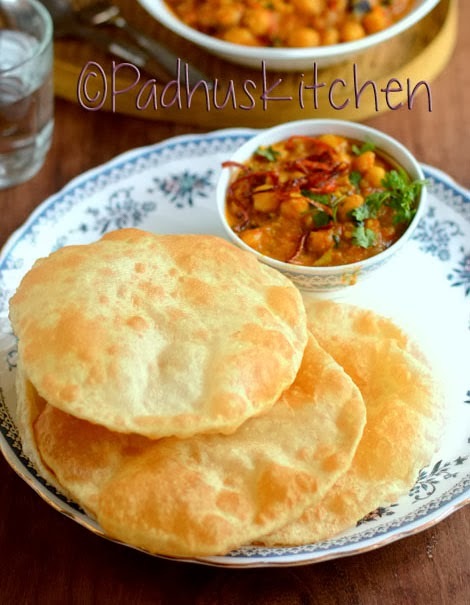 Chole bhature looks delicious and mouthwatering..
Thankd padhu for your wonderful receipe. Bhature and chole,both makes me hungry Padhu. Bhatura looks yummy...perfect combo ..
Are we using seasonings also? Wow! Padhuskitchen is my favourite! Awesome recipes.You write it so well unlike others who blog. Nice recipe, pictures look great. Poori is not the same as Bhatura though. Chole Poori is one thing and chole bhature is a different thing. What you made is more like a poori. Bhatura has a different dough and is a lot more chewy and stretchy than poori. Poori dough is closer to a roti dough and bhatura dough is leavened, using yeast. The dough is known as a khameer atta. Yes padhu.. I support the above comment... The one u demostrated s a poori kind... Batura s prepared adding yeast curd etc to the same.. N should let t ferment. Hope to c more delicious recipes from u.
I have mentioned it. It seems you missed it. It is written above the 5th picture under Punjabi Chole Recipe "Method"
I like the way you chop and keep. So neat and meticulous! Do you grind the seasoning spices before frying or add them whole? No, I have added whole spices. For chole/channa, we use only channa masala as it will give you the taste of a perfect chole masala. If you do not add, it is not a problem. You can add garam masala.